For new parents who are maybe looking for a cheaper and more convenient alternative to a traditional changing table, a folding changing table is a great choice. Not only is a folding changing table cheaper than many other types of changing tables but more importantly it is designed to help parents with a more comfortable and practical nappy changing session with their baby. The material used in the construction of a folding changing table is usually a lightweight plastic or wood that is also sturdy and robust. Typically the dimensional of the unit are also a lot smaller than many other types of changing tables. What brands of folding changing tables are available for the UK market? Baby Diego is a mid range manufacturer of baby changing tables that remains high up on the popularity list with parents in the UK. For a baby Diego, expect to pay around 80 pounds or upwards for a folding changing table. Cariboo is also another popular example of a folding changing table and this particular brand is well-known for their stylish and simplistic designs that go well with any nursery style or design. Graco being one of the better-known brands who also make pushchairs offer some wonderful folding changing tables available to the UK market also. Folding changing tables were designed with convenience in mind. They allow you to easily move the unit from one room to another and many of the higher end examples also come with conveniently placed under trays to store baby accessories too. Whilst these type of changing tables are indeed very easy to maneuver and move from one room to another there are also disadvantages too. When comparing a folding table against some of the bigger and heavier dressing changing tables for example, folding tables are generally not as robust and durable and the overall stability can also be an issue. They are designed for the sole purpose of being convenient to use so if it is storage space and long-lasting durability that you are looking for then this may not be the most suitable of choices. If however space is not one of your main concerns then this may just be the right baby product for you. They are not only great for moving from one room of the house to another but are also perfectly suitable and portable enough to be carried around whilst travelling. They also come with a changing pad made of fabric that can be easily washed. 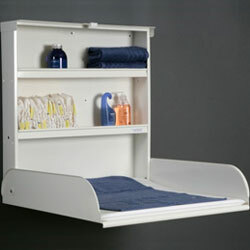 This type of baby changing table is a really sensible investment for new parents and their child. If you ever need to take a few days away from home simply fold up the unit, put it into your vehicle and when you arrive at your destination unfold it completely hassle-free.